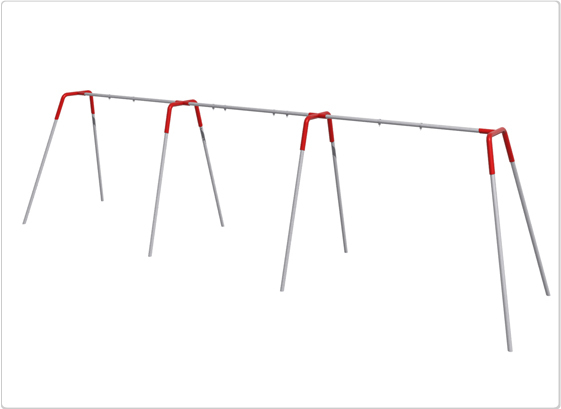 This heavy commercial-grade swing set structures has three bays. It is designed for use with 2 ADA swings (in the outside bays) and 2 non-ADA swings (in the center bay). This swing set is the definition of inclusive play. It allows for all children to be able to play together on the swings safely. The unit is a modern bipod structure (note the curved swing yokes that connect the vertical posts to the horizontal beam). This structure has 8 vertical posts. It includes swing set hangers (eight of them), but it does not include any swings or other parts (chains or fasteners/connectors). To see our selection of ADA swing seats, just click here. We also sell complete ADA swing set packages, including seats, in a smaller, 2-bay design: 2-Bay ADA Swing Set with 2 Wheelchair Platforms and 2-Bay ADA Swing Set with 1 Wheelchair Platform and 1 ADA Seat. You can also add non ADA swing seats which can be found here. Size: 30′ x 8′ x 6.5′ Use Zone: 32′ x 51.5′ Weight: 320 lbs.